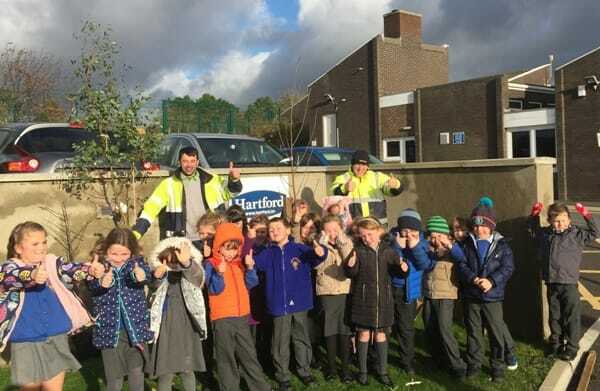 Hartford builders from the nearby Cronk Cullyn development in Colby were joined by year two pupils to plant saplings in the car park and playing fields. Earlier this year, Hartford donated and built a mud kitchen at Arbory School as part of an ongoing project to boost its outdoor play area and equipment. Cronk Cullyn sits behind the Colby Glen Pub and the local shop and will feature a wide range of new homes from 2 bed bungalows to 4 and 5 bed family houses, along with a fully-equipped play area. There are just 16 of the 62 homes available to buy and the show home is due to open soon.